The Legal Genealogist has been talking about notaries this week and, most particularly, notarial acts and records in what are called civil law jurisdictions. Those are places where the legal tradition comes out of the civil law and not out of the British common law. Places like Louisiana, Quebec, Puerto Rico, and much of the European continent. But civil notaries weren’t and aren’t the only people who used the title notary public. That’s a role played in common law jurisdictions as well and often the most intriguing genealogical records will be those created by, or sworn before, a notary public. 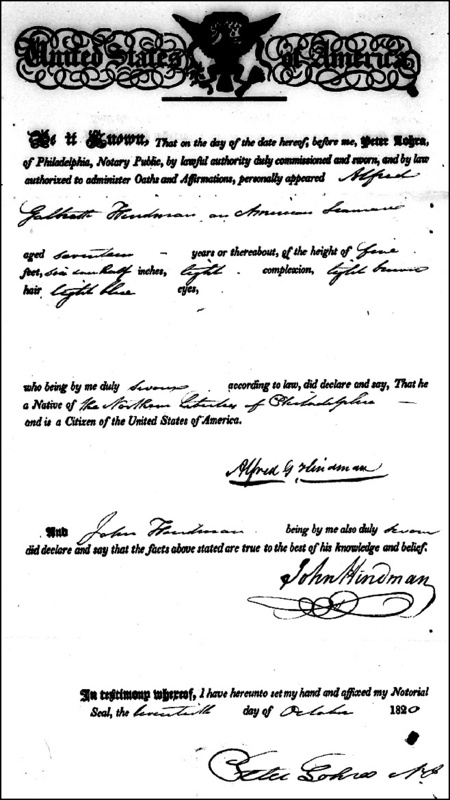 Case in point: the proofs of citizenship for seamen’s protection certificates. On May 28, 1796, An Act For The Relief and Protection of American Seamen (1 Stat. 477), which includes instructions for the issuance of certificates of citizenship to seamen, was signed into law. These documents later became commonly known as seamen’s protection certificates. These certificates were issued by the collector of customs at individual ports of entry to merchant seamen and masters of merchant vessels engaged in foreign trade. The object was to prevent the detention and impressment of American seamen lawfully engaged in the service of a U.S. merchant vessel. It is apparent from the first section of the Act that this was a direct response to the detention and impressment of American seamen by officials of the government of Great Britain. Application for a certificate was strictly voluntary; seamen were not required to have them when serving on U.S. merchant vessels. Certificates were issued only after the seaman produced a proof of citizenship, and applicants were required to pay 25 cents for each certificate issued. The format of the certificate was spelled out in section 4 of the Act. The collector normally did not retain a copy of the certificate issued but did maintain the proofs and a record of issuance of the certificate. The collector was to forward quarterly to the Department of State a list of seamen registered under the Act. These abstracts are now part of RG 36. These aren’t always the easiest records to use since they’re not all indexed. The ones from Bath and Portsmouth are indexed on FamilySearch; the more numerous ones from Philadelphia are not. Now, just because these certificates could be executed before a notary public doesn’t mean they had to be executed before a notary public. Some were done in the presence of a customs collector, and some in the presence of a city alderman. But enough used a notary that — like the ones listed above — there were preprinted forms that the notary used. Cool records, and worth the effort to work through them. Just one more thing the notaries did that we as genealogists can use. The indexing was performed by volunteers at the New England Historic Genealogical Society. Good to know, Chad — even if you do (gasp) have to have a paid subscription to use the records on Ancestry. The certificates from Philadelphia are being indexed by FamilySearch.org because I indexed some of them last fall. Very interesting it was, too!